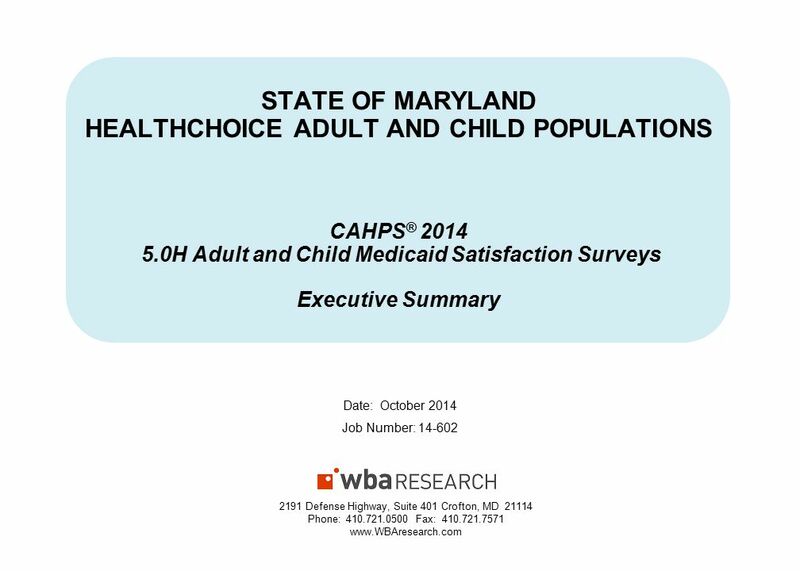 STATE OF MARYLAND HEALTHCHOICE ADULT AND CHILD POPULATIONS CAHPS ® 2014 5.0H Adult and Child Medicaid Satisfaction Surveys Executive Summary Date: October. 2 2 2014 State of Maryland Adult and Child Medicaid Populations Executive Summary Background and Purpose Beginning in 2008, the State of Maryland Department of Health and Mental Hygiene (DHMH) selected WBA Research (WBA), a National Committee for Quality Assurance (NCQA) certified survey vendor, to conduct its Consumer Assessment of Healthcare Providers and Systems (CAHPS ® ) 1 4.0H Adult Medicaid Satisfaction Survey and 4.0H Child Medicaid Satisfaction Survey (with Children with Chronic Conditions (CCC) Measurement Set) 2. The purpose of the survey is to assess members’ experience with their health plan. 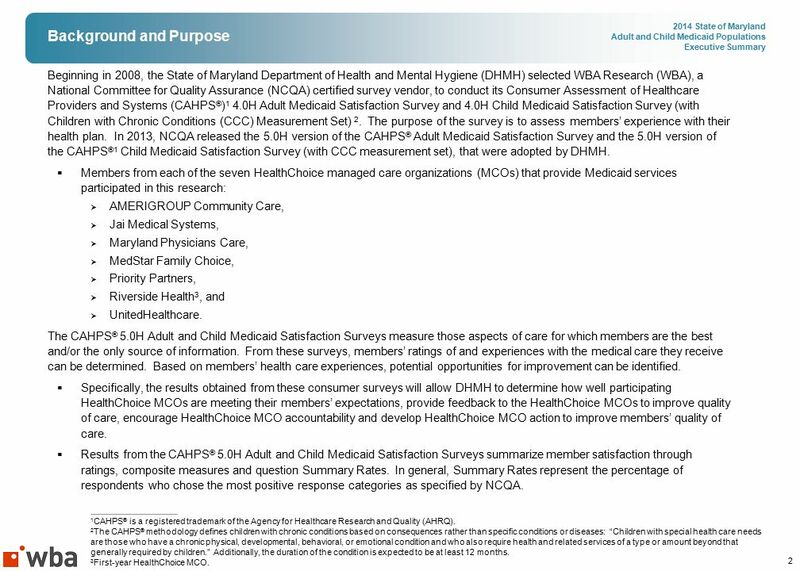 In 2013, NCQA released the 5.0H version of the CAHPS ® Adult Medicaid Satisfaction Survey and the 5.0H version of the CAHPS ®1 Child Medicaid Satisfaction Survey (with CCC measurement set), that were adopted by DHMH.  Members from each of the seven HealthChoice managed care organizations (MCOs) that provide Medicaid services participated in this research:  AMERIGROUP Community Care,  Jai Medical Systems,  Maryland Physicians Care,  MedStar Family Choice,  Priority Partners,  Riverside Health 3, and  UnitedHealthcare. The CAHPS ® 5.0H Adult and Child Medicaid Satisfaction Surveys measure those aspects of care for which members are the best and/or the only source of information. From these surveys, members’ ratings of and experiences with the medical care they receive can be determined. Based on members’ health care experiences, potential opportunities for improvement can be identified.  Specifically, the results obtained from these consumer surveys will allow DHMH to determine how well participating HealthChoice MCOs are meeting their members’ expectations, provide feedback to the HealthChoice MCOs to improve quality of care, encourage HealthChoice MCO accountability and develop HealthChoice MCO action to improve members’ quality of care.  Results from the CAHPS ® 5.0H Adult and Child Medicaid Satisfaction Surveys summarize member satisfaction through ratings, composite measures and question Summary Rates. In general, Summary Rates represent the percentage of respondents who chose the most positive response categories as specified by NCQA. 1 CAHPS ® is a registered trademark of the Agency for Healthcare Research and Quality (AHRQ). 2 The CAHPS ® methodology defines children with chronic conditions based on consequences rather than specific conditions or diseases: “Children with special health care needs are those who have a chronic physical, developmental, behavioral, or emotional condition and who also require health and related services of a type or amount beyond that generally required by children.” Additionally, the duration of the condition is expected to be at least 12 months. 3 First-year HealthChoice MCO. 3 3 2014 State of Maryland Adult and Child Medicaid Populations Executive Summary Background and Purpose (continued) Survey and Reporting Changes in 2014  In 2014, NCQA made no survey changes to the 5.0H version of the CAHPS ® Child Medicaid Satisfaction Survey, but did make one addition to the 5.0H version of the CAHPS ® Adult Medicaid Satisfaction Survey:  Added the Flu Vaccination for Adults (FVA) measure as question 38.  The Maryland DHMH made no changes to the CAHPS ® 5.0H Adult or Child Medicaid Surveys in 2014. 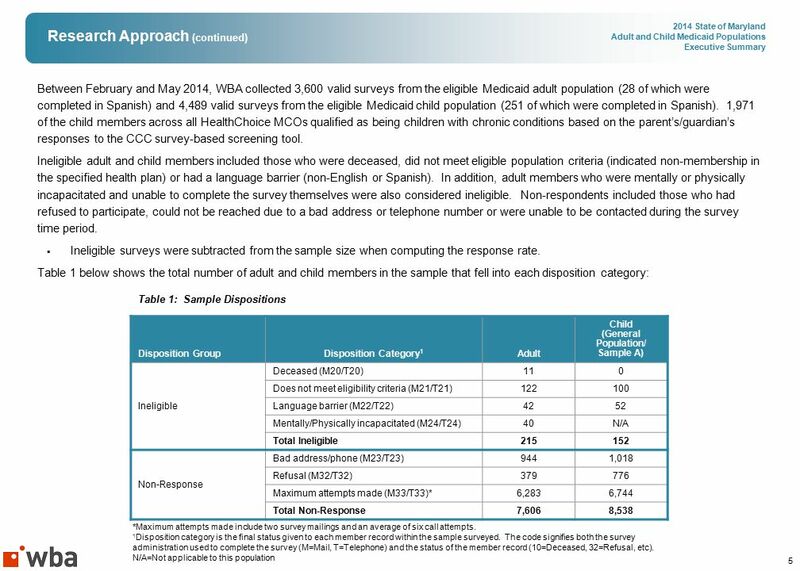 4 4 2014 State of Maryland Adult and Child Medicaid Populations Executive Summary Research Approach WBA administered a mixed-methodology that involved a mail survey with telephone follow-up per NCQA protocol.  Specifically, two questionnaire packages and follow-up postcards were sent to random samples of eligible adult and child members from each of the seven HealthChoice MCOs with “Return Service Requested” and WBA’s toll-free telephone number included. The mail materials also included a toll-free telephone number for Spanish-speaking members to complete the survey over the telephone. Those who did not respond by mail were contacted by telephone to complete the survey. During the telephone follow-up, members had the option to complete the survey in either English or Spanish.  The child surveys were conducted by proxy, that is, with the parent/guardian who knows the most about the sampled child’s health care.  The NCQA required sample size is 1,350 for adult Medicaid plans and 1,650 for child Medicaid plans (General Population). 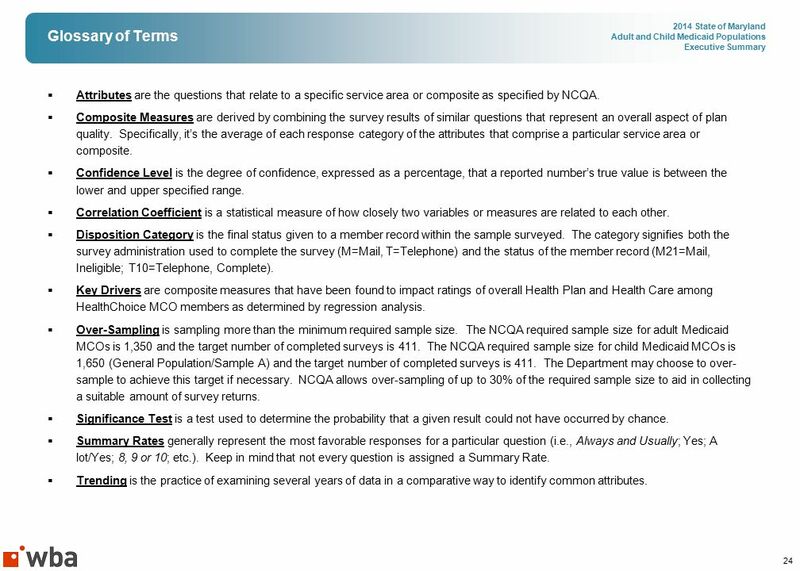 In addition to the required sample size, NCQA allows over-sampling up to 30% of the required sample size to aid in collecting a sufficient number of completed surveys at the end of the survey administration. DHMH elected to use this option.  To qualify, adult Medicaid members had to be 18 years of age or older, while child Medicaid members had to be 17 years of age or younger. Furthermore, members of both populations had to be continuously enrolled in the HealthChoice MCO for five of the last six months as of the last day of the measurement year (December 31, 2013).  Among the child population, an additional over-sample of up to 1,840 child members with diagnoses indicative of a probable chronic condition was also pulled (Children with Chronic Conditions (CCC) Over-sample). 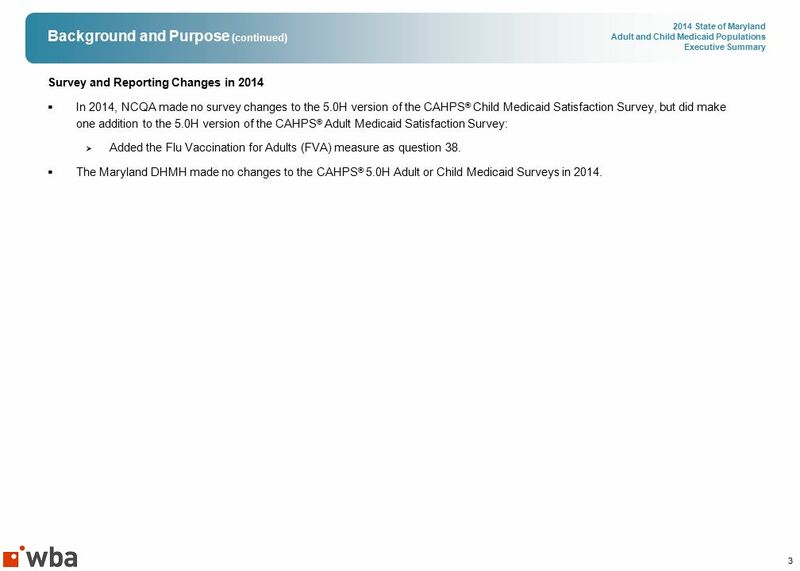 This is standard procedure when the CAHPS ® 5.0H Child Medicaid Satisfaction Survey (with CCC Measurement Set) is administered, to ensure the validity of the information collected. 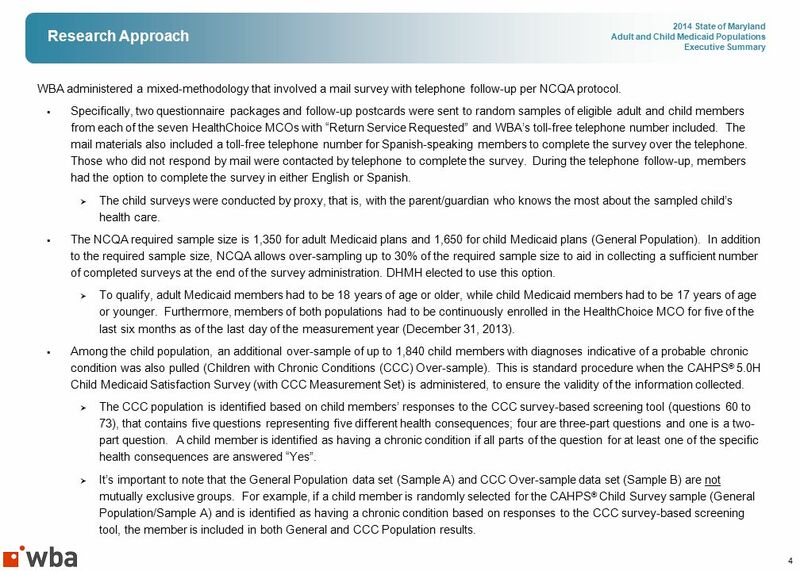  The CCC population is identified based on child members’ responses to the CCC survey-based screening tool (questions 60 to 73), that contains five questions representing five different health consequences; four are three-part questions and one is a two- part question. A child member is identified as having a chronic condition if all parts of the question for at least one of the specific health consequences are answered “Yes”.  It’s important to note that the General Population data set (Sample A) and CCC Over-sample data set (Sample B) are not mutually exclusive groups. 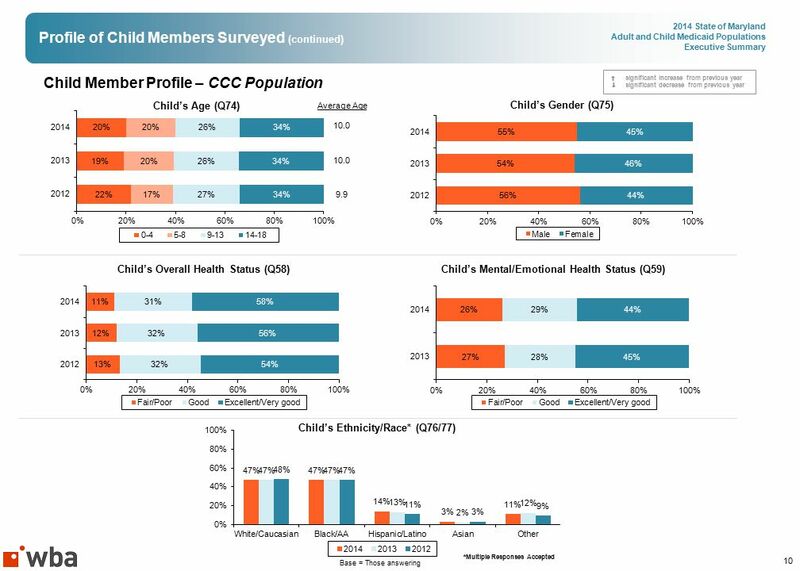 For example, if a child member is randomly selected for the CAHPS ® Child Survey sample (General Population/Sample A) and is identified as having a chronic condition based on responses to the CCC survey-based screening tool, the member is included in both General and CCC Population results. 14 14 2014 State of Maryland Adult and Child Medicaid Populations Executive Summary Composite Measures Composite measures assess results for main issues/areas of concern. These composite measures were derived by combining survey results of similar questions (note: two of the composite measures are comprised of only one question). Specifically, it’s the average of each response category of the attributes that comprise a particular service area or composite. 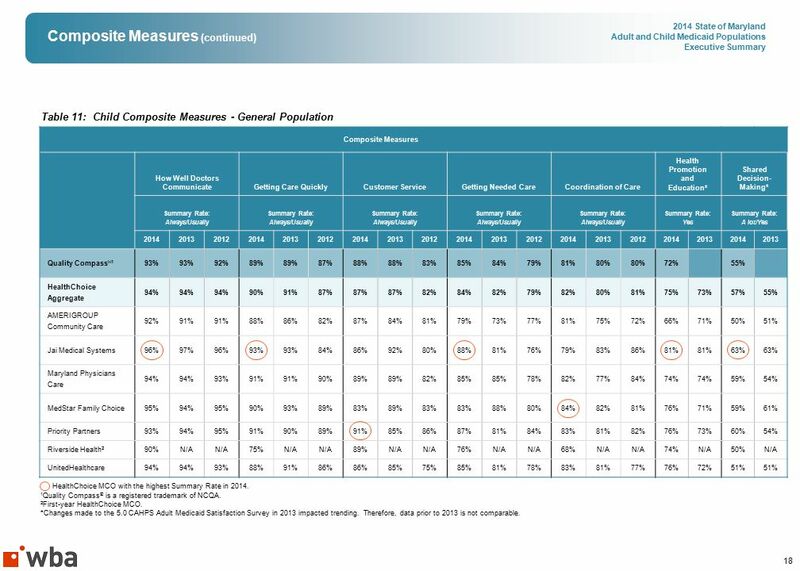  The CAHPS ® 5.0H Adult Medicaid Satisfaction Survey includes seven composite measures, defined below. Table 7: Adult Composite Measure Definitions Composite Measure/Rating Item Survey Question NumberWhat is MeasuredSummary Rate 1 Getting Needed Care14 and 25 Measures members’ experiences in the last 6 months when trying to get care from specialists and through their health plan % of members who responded “ Usually” or “Always” Getting Care Quickly4 and 6 Measures members’ experiences with receiving care and getting appointments as soon as they needed % of members who responded “Usually” or “Always” How Well Doctors Communicate17, 18, 19 and 20 Measures how well personal doctor explains things, listens to them, shows respect for what they have to say and spends enough time with them % of members who responded “Usually” or “Always” Customer Service31 and 32 Measures members’ experiences with getting the information needed and treatment by Customer Service staff % of members who responded “Usually” or “Always” Shared Decision-Making10, 11 and 12 Measures members’ experiences with doctors discussing the pros and cons of starting or stopping a prescription medicine and asking the member what they thought was best for them % of members who responded “A lot” or “Yes” Health Promotion and Education8 Measures members’ experience with their doctor discussing specific things to do to prevent illness % of members who responded “Yes” Coordination of Care22 Measures members’ perception of whether their doctor is up-to-date about the care he/she received from other doctors or health providers % of members who responded “Usually” or “Always” 1 Summary Rates most often represent the most favorable responses for that question. 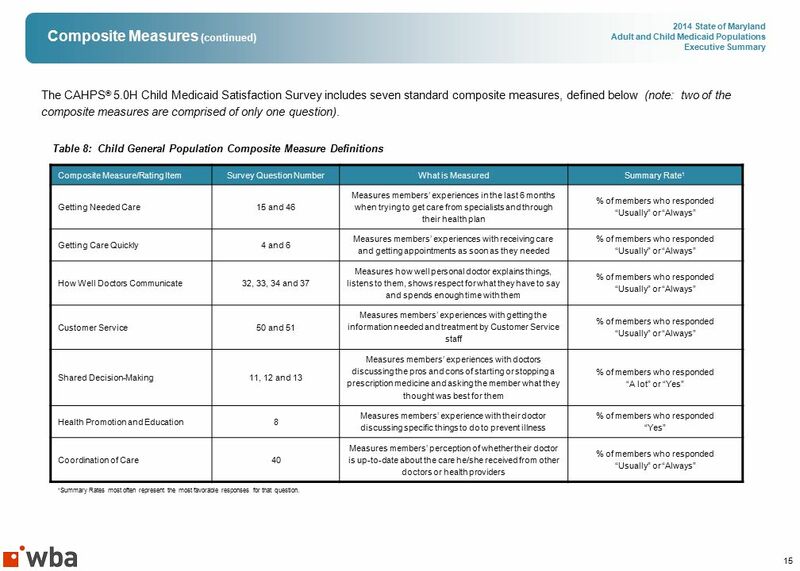 15 15 2014 State of Maryland Adult and Child Medicaid Populations Executive Summary Composite Measures (continued) The CAHPS ® 5.0H Child Medicaid Satisfaction Survey includes seven standard composite measures, defined below (note: two of the composite measures are comprised of only one question). Table 8: Child General Population Composite Measure Definitions Composite Measure/Rating Item Survey Question NumberWhat is MeasuredSummary Rate 1 Getting Needed Care15 and 46 Measures members’ experiences in the last 6 months when trying to get care from specialists and through their health plan % of members who responded “Usually” or “Always” Getting Care Quickly4 and 6 Measures members’ experiences with receiving care and getting appointments as soon as they needed % of members who responded “Usually” or “Always” How Well Doctors Communicate32, 33, 34 and 37 Measures how well personal doctor explains things, listens to them, shows respect for what they have to say and spends enough time with them % of members who responded “Usually” or “Always” Customer Service50 and 51 Measures members’ experiences with getting the information needed and treatment by Customer Service staff % of members who responded “Usually” or “Always” Shared Decision-Making11, 12 and 13 Measures members’ experiences with doctors discussing the pros and cons of starting or stopping a prescription medicine and asking the member what they thought was best for them % of members who responded “A lot” or “Yes” Health Promotion and Education8 Measures members’ experience with their doctor discussing specific things to do to prevent illness % of members who responded “Yes” Coordination of Care40 Measures members’ perception of whether their doctor is up-to-date about the care he/she received from other doctors or health providers % of members who responded “Usually” or “Always” 1 Summary Rates most often represent the most favorable responses for that question. 16 16 2014 State of Maryland Adult and Child Medicaid Populations Executive Summary Composite Measures (continued) CCC measurement composite scores are derived by combining survey results of similar questions related to basic components for successful treatment, management and support of children with chronic conditions (note: two of the composite measures are comprised of only one question). 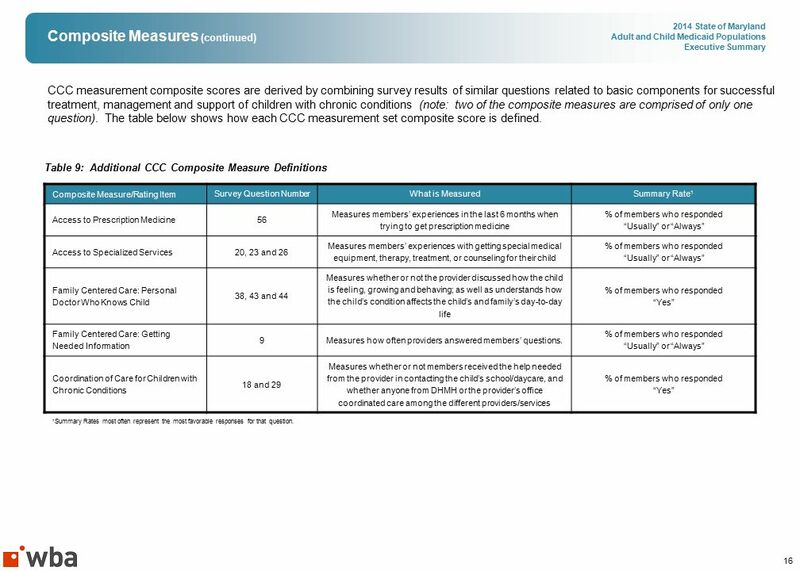 The table below shows how each CCC measurement set composite score is defined. Table 9: Additional CCC Composite Measure Definitions Composite Measure/Rating Item Survey Question NumberWhat is MeasuredSummary Rate 1 Access to Prescription Medicine56 Measures members’ experiences in the last 6 months when trying to get prescription medicine % of members who responded “Usually” or “Always” Access to Specialized Services20, 23 and 26 Measures members’ experiences with getting special medical equipment, therapy, treatment, or counseling for their child % of members who responded “Usually” or “Always” Family Centered Care: Personal Doctor Who Knows Child 38, 43 and 44 Measures whether or not the provider discussed how the child is feeling, growing and behaving; as well as understands how the child’s condition affects the child’s and family’s day-to-day life % of members who responded “Yes” Family Centered Care: Getting Needed Information 9Measures how often providers answered members’ questions. 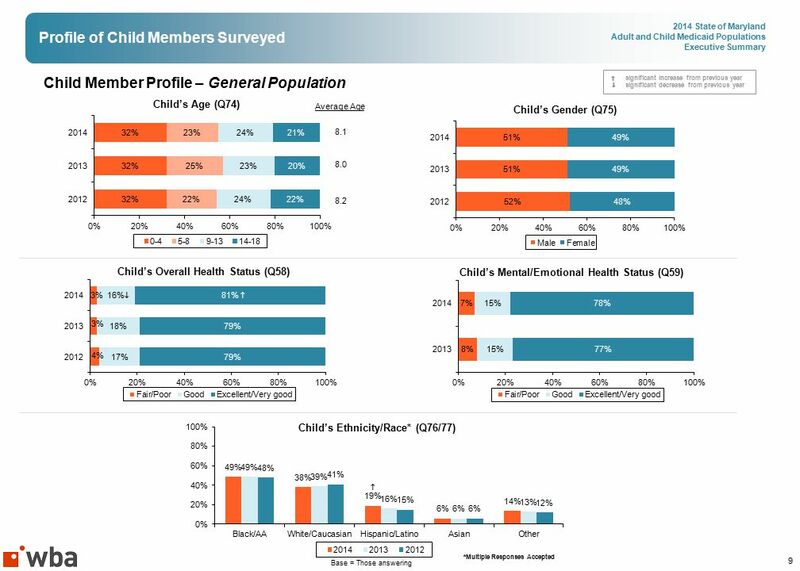 % of members who responded “Usually” or “Always” Coordination of Care for Children with Chronic Conditions 18 and 29 Measures whether or not members received the help needed from the provider in contacting the child’s school/daycare, and whether anyone from DHMH or the provider’s office coordinated care among the different providers/services % of members who responded “Yes” 1 Summary Rates most often represent the most favorable responses for that question. 21 21 2014 State of Maryland Adult and Child Medicaid Populations Executive Summary Key Drivers of Satisfaction In an effort to identify the underlying components of adult and child members’ ratings of their Health Plan and Health Care, advanced statistical techniques were employed.  Regression analysis is a statistical technique used to determine which influences or “independent variables” (composite measures) have the greatest impact on an overall attribute or “dependent variable” (overall rating of Health Plan or Health Care).  In addition, correlation analyses were conducted between each composite measure attribute and overall rating of Health Plan and Health Care in order to ascertain which attributes have the greatest impact. 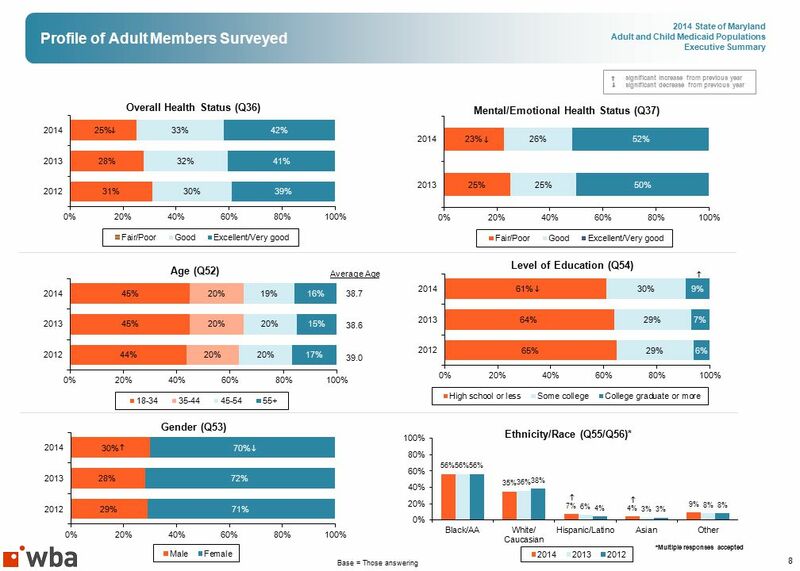 Adult Medicaid Members – Key Drivers of Satisfaction with Health Plan Based on the 2014 findings, the “Customer Service” and “Getting Needed Care” composite measures have the most significant impact on adult members’ overall rating of their Health Plan.  The attribute listed below is identified as an unmet need 1 and should be considered a priority area for the HealthChoice MCOs. If performance on this attribute is improved, it could have a positive impact on adult members’ overall rating of their Health Plan.  Received information or help needed from health plan’s Customer Service  The following attributes are identified as driving strengths 2 and performance in these areas should be maintained. If performance on these attributes is decreased, it could have a negative impact on adult members’ overall rating of their Health Plan.  Treated with courtesy and respect by health plan’s Customer Service  Doctor showed respect for what you had to say Adult Medicaid Members – Key Drivers of Satisfaction with Health Care Based on the 2014 findings, the “Getting Needed Care” composite measure has the most significant impact on adult members’ overall rating of their Health Care.  There were no attributes identified as unmet needs 1 that should be considered priority areas for improving adult members’ overall rating of their Health Care.  However, there are four attributes that are identified as key drivers that are of high importance to members where they perceive HealthChoice MCOs to be performing moderately well. 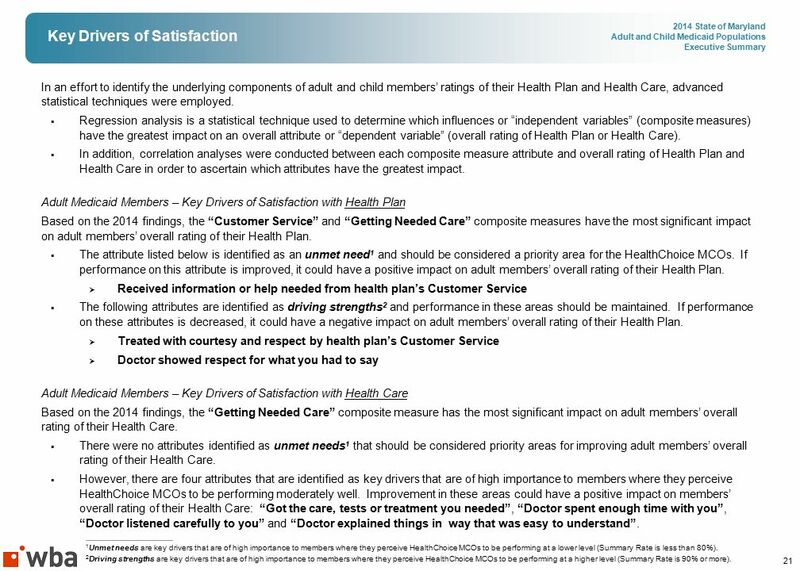 Improvement in these areas could have a positive impact on members’ overall rating of their Health Care: “Got the care, tests or treatment you needed”, “Doctor spent enough time with you”, “Doctor listened carefully to you” and “Doctor explained things in way that was easy to understand”. 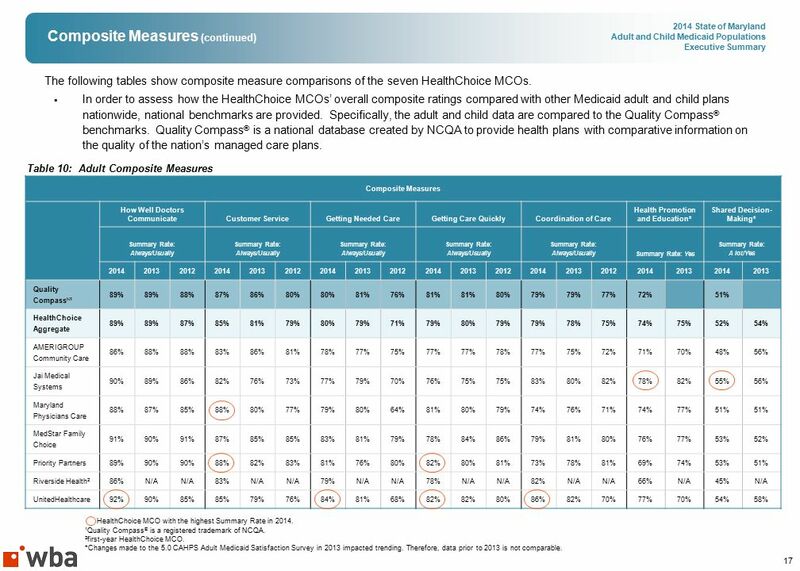 1 Unmet needs are key drivers that are of high importance to members where they perceive HealthChoice MCOs to be performing at a lower level (Summary Rate is less than 80%). 2 Driving strengths are key drivers that are of high importance to members where they perceive HealthChoice MCOs to be performing at a higher level (Summary Rate is 90% or more). 22 22 2014 State of Maryland Adult and Child Medicaid Populations Executive Summary Key Drivers of Satisfaciton (continued) Adult Medicaid Members – Key Drivers of Satisfaction with Health Care (continued)  The attribute “Doctor showed respect for what you had to say” is identified as a driving strength 2 and performance in this area should be maintained. If performance on this attribute is decreased, it could have a negative impact on adult members’ overall rating of their Health Care. 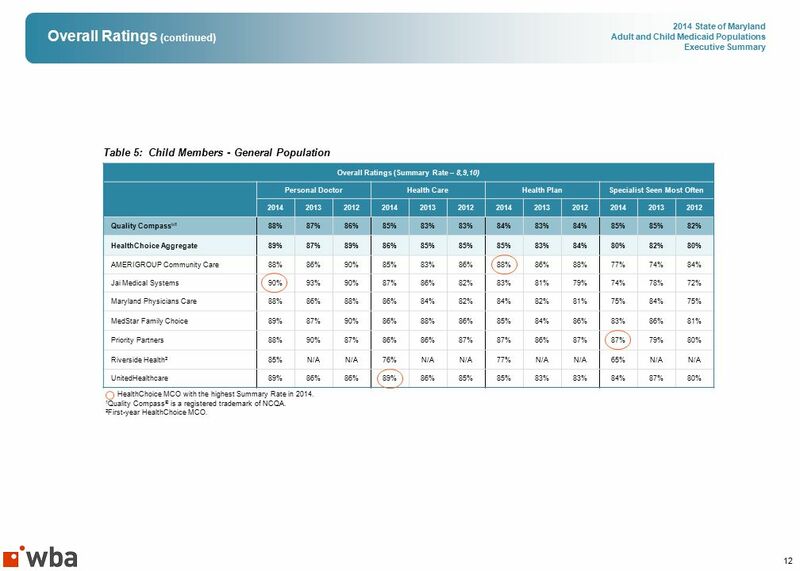 Child Medicaid Members – Key Drivers of Satisfaction with Health Plan Based on the 2014 findings, the “How Well Doctors Communicate” composite measure has the most significant impact on child members’ overall rating of their Health Plan.  There were no attributes identified as unmet needs 1 that should be considered priority areas for improving child members’ overall rating of their Health Plan.  However, the attribute “Received information or help needed from child’s health plan’s Customer Service” is an area that is of high importance to child members where HealthChoice MCOs perform at a moderate level. 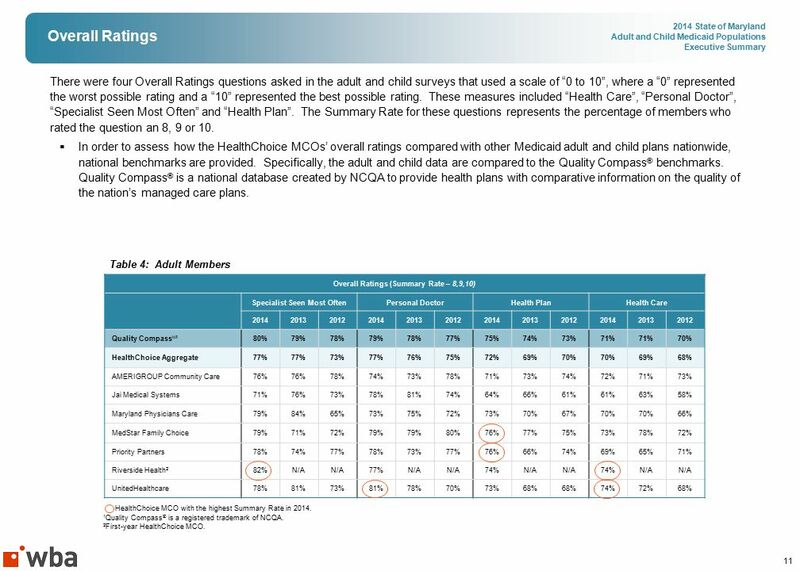 Improvement in this area could have a positive impact on child members’ overall rating of their Health Plan.  The attributes listed below are identified as driving strengths 2 and performance in these areas should be maintained. If performance on these attributes is decreased, it could have a negative impact on child members’ overall rating of their Health Plan.  Treated with courtesy and respect by child’s health plan’s Customer Service  Got the care, tests or treatment your child needed Child Medicaid Members – Key Drivers of Satisfaction with Health Care Based on the 2014 findings, the “Getting Needed Care” and “How Well Doctors Communicate” composite measures are identified as having the most significant impact on child members’ overall rating of their Health Care. 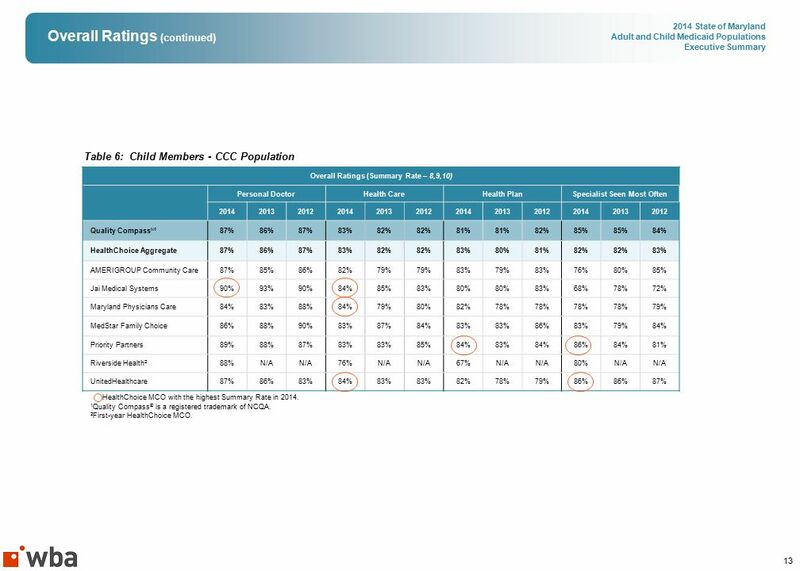  Given some of the high ratings received, there were no attributes identified as unmet needs 1 that should be considered priority areas for improving child members’ overall rating of their Health Care.  However, the attribute “Received an appointment for a check-up or routine care for your child as soon as they needed” is an area that is of high importance to child members where HealthChoice MCOs perform at a moderate level. Improvement in this area could have a positive impact on child members’ overall rating of their Health Care. 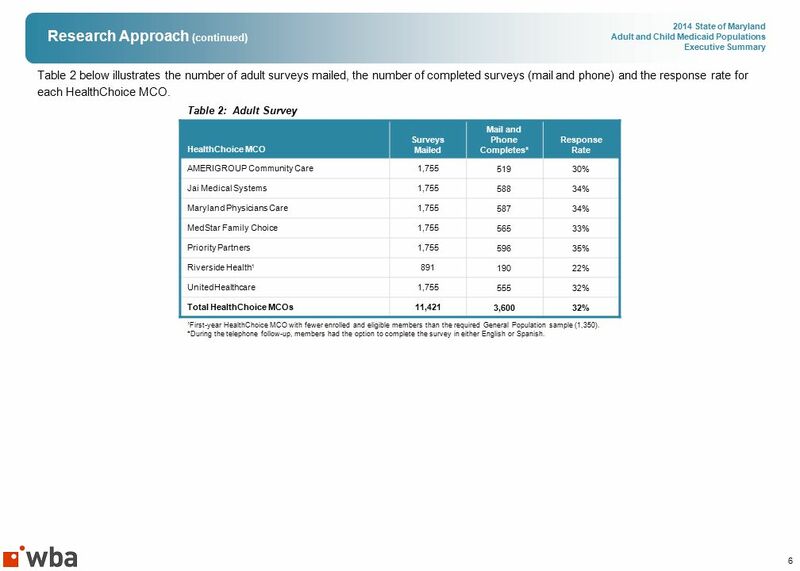 1 Unmet needs are key drivers that are of high importance to members where they perceive HealthChoice MCOs to be performing at a lower level (Summary Rate is less than 80%). 2 Driving strengths are key drivers that are of high importance to members where they perceive HealthChoice MCOs to be performing at a higher level (Summary Rate is 90% or more). 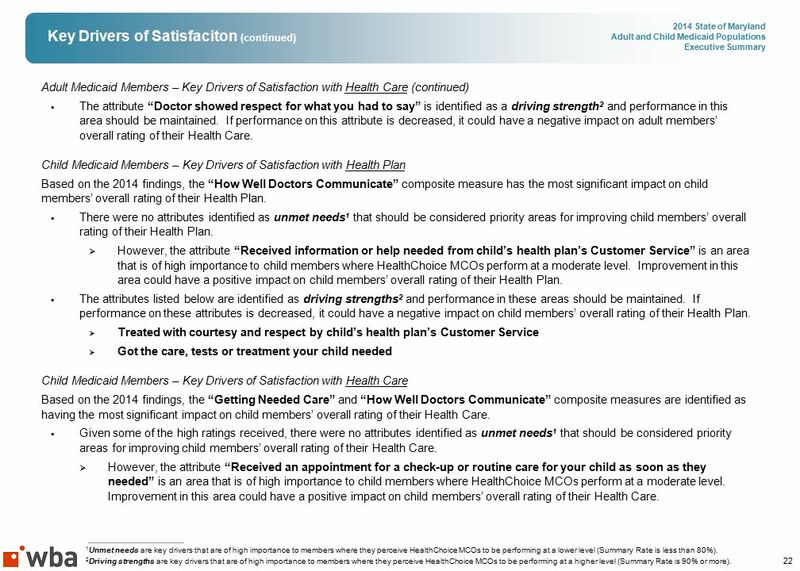 23 23 2014 State of Maryland Adult and Child Medicaid Populations Executive Summary Key Drivers of Satisfaciton (continued) Child Medicaid Members – Key Drivers of Satisfaction with Health Care (continued)  Instead, the attributes listed below are identified as driving strengths 2 and performance in these areas should be maintained. If performance on these attributes is decreased, it could have a negative impact on child members’ overall rating of their Health Care.  Got the care, tests or treatment your child needed  Child’s doctor listened carefully to you  Child’s doctor explained things about your child’s health in a way that was easy to understand  Child’s doctor showed respect for what you had to say  Child’s doctor spent enough time with your child 1 Unmet needs are key drivers that are of high importance to members where they perceive HealthChoice MCOs to be performing at a lower level (Summary Rate is less than 80%). 2 Driving strengths are key drivers that are of high importance to members where they perceive HealthChoice MCOs to be performing at a higher level (Summary Rate is 90% or more). 24 24 2014 State of Maryland Adult and Child Medicaid Populations Executive Summary Glossary of Terms  Attributes are the questions that relate to a specific service area or composite as specified by NCQA.  Composite Measures are derived by combining the survey results of similar questions that represent an overall aspect of plan quality. Specifically, it’s the average of each response category of the attributes that comprise a particular service area or composite.  Confidence Level is the degree of confidence, expressed as a percentage, that a reported number’s true value is between the lower and upper specified range.  Correlation Coefficient is a statistical measure of how closely two variables or measures are related to each other.  Disposition Category is the final status given to a member record within the sample surveyed. The category signifies both the survey administration used to complete the survey (M=Mail, T=Telephone) and the status of the member record (M21=Mail, Ineligible; T10=Telephone, Complete). 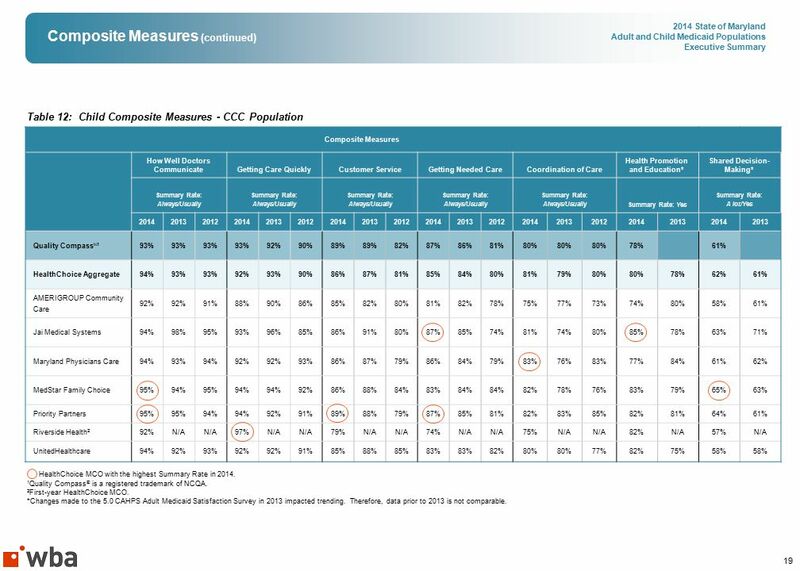  Key Drivers are composite measures that have been found to impact ratings of overall Health Plan and Health Care among HealthChoice MCO members as determined by regression analysis.  Over-Sampling is sampling more than the minimum required sample size. The NCQA required sample size for adult Medicaid MCOs is 1,350 and the target number of completed surveys is 411. 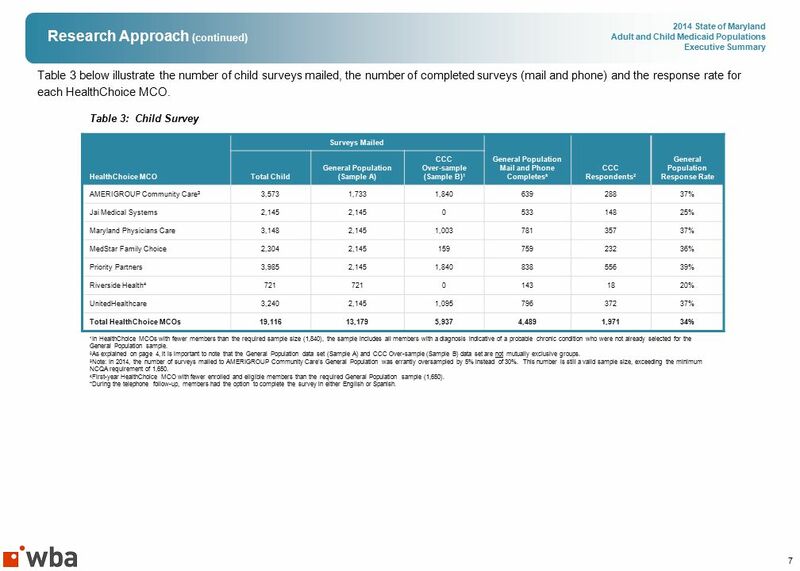 The NCQA required sample size for child Medicaid MCOs is 1,650 (General Population/Sample A) and the target number of completed surveys is 411. The Department may choose to over- sample to achieve this target if necessary. NCQA allows over-sampling of up to 30% of the required sample size to aid in collecting a suitable amount of survey returns.  Significance Test is a test used to determine the probability that a given result could not have occurred by chance.  Summary Rates generally represent the most favorable responses for a particular question (i.e., Always and Usually; Yes; A lot/Yes; 8, 9 or 10; etc.). Keep in mind that not every question is assigned a Summary Rate.  Trending is the practice of examining several years of data in a comparative way to identify common attributes. Download ppt "STATE OF MARYLAND HEALTHCHOICE ADULT AND CHILD POPULATIONS CAHPS ® 2014 5.0H Adult and Child Medicaid Satisfaction Surveys Executive Summary Date: October."